One of the most trusted names in funeral cover in South Africa is Hollard. With any Hollard funeral cover products, you can get the peace of mind knowing that your whole family will have enough money to cover the costs of your and their burials. Hollard doesn't just offer one funeral plan, but a couple of plans. There are also plans that Hollard underwrites for different insurance brokers, and non-financial institutions, most notably the Hollard Kaizer Chiefs Funeral Plan. You can get Hollard funeral cover quotes from the company's website, but what these insurance quotes entail are the following. There is the standard funeral cover from Hollard. This can cover you for a maximum amount of R50-000. Cover starts at an equivalent of R2 per day. With this cover comes a couple of benefits that can appeal to you. First and foremost, this is one of the most comprehensive funeral covers in South Africa, and accepts any qualifying citizen up to the age of 75. Most other plans have an age limit of 65. Hollard offers you an extension also, where you can cover up to 5 of your children under the age of 21. These children can be covered for a maximum of R20-000 per child. If your parents and/or parents in-law are still alive and you would like to insure them, then you are more than welcome. Cover for extended family members like parents is set at a maximum of R20-000 per member. While your spouse can get as much cover as you have in your policy. R2000 monthly provision for expenses when you die. This amount varies depending on your cover, and will be spread over 12 months after your death. A memorial benefit of up to R10-000. A minor life cover policy of R150-000 taken on to of your funeral policy. 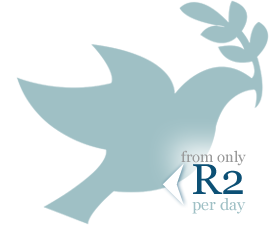 Daily hospital benefit of a maximum R750 per day payable over 180 of you being in hospital. You also have the option to cover your spouse, children, parents, and other members of your extended family under the same policy. The main advantage of this is that your entire family remains insured throughout your life, so that if anyone may die, you know that Hollard will take care of your burial finances. Again, all of this information will be detailed in your policy. The maximum amount of cover you can take for your spouse under your own policy is R50-000. Your children can be covered for a maximum R20-000 each. While your parents and in-laws can also be insured for a maximum of R20-000 each. You can buy a Hollard funeral policy on the internet, over the phone (see contact details below), or even through any of Hollard Insurance's many hundreds of funeral insurance brokers countrywide. With any one of those mediums, a Hollard representative is ready to welcome you. Your policy is the contract which you agree upon when you take up funeral cover. It details the specific product which you have bought from Hollard. The policy document also clearly indicates your monthly premiums, which are more or less the same as your funeral policy quotes that you get online (or through any of the ways mentioned above). Your obligation to pay the premiums entitle you to the benefits of your policy, and ensure that you and whoever else covered under your policy remain insured, and finally, that with this payment, your beneficiaries will be paid the lump-sum of your cover and other benefits on your death. Hollard has one main funeral insurance product, with the exception of the many other funeral policies they underwrite and brand for other companies and brokers. Your policy with Hollard offers standard funeral cover to the amount of R50-000. A young person between 18 and 20 years for example, can get R50-000 funeral cover for as little as R85.50 (as of 2014). Hollard is a big insurer, and as such can pass other insurances your way at a fraction of the cost of stand alone products. With your policy, you can agree to take up the following for a small additional premium. Cover for accidental death. Upon receipt of your first monthly premium, Hollard will immediately cover you for accidental death. However, there is a waiting period of 12 months for natural death and 2 years for suicides. Hollard has an easy maintenance and claims process. By just using your policy number, which is the unique number associated with your ID number, you can make changes to your policy online. These changes can be increasing your cover amount, adding or removing a beneficiary, changing your billing details and so on. Furthermore, the claims process has been made easily accessible through the internet. However, another sure and easy way is to contact the company directly. With your policy on hand, and the necessary documents, you or your beneficiaries can make a claim as per your policy. And as has become an industry standard by now, the claim can be processed and your lump-sum money deposited in the bank account within 2 days. It's easy to buy a funeral policy from Hollard, but it starts with getting all the information you need on hand before you commit to buying cover. This also equips you to make comparisons with other funeral policy providers whose quotes you can use by filling in our form above.